The successful third Go North Wales Tourism Awards was held on Thursday 15 November at Venue Cymru, Llandudno to celebrate and recognise excellence and outstanding achievement by our businesses and individuals working in the tourism hospitality sector of North Wales. List of all the winners and finalists from the Awards plus gallery of images is available on our website. 2019 event will take place on Thursday 14 November – keep posted on our website and social media for updates. Both shows are really busy and very well attended with a lot of interest in North Wales and its products. Wales Tourism Week highlights the importance of the tourism industry to Wales in income and job generation and in supporting our cultural identity. Wales Tourism Week is held annually to raise the profile of the tourism industry and to highlight its huge revenue generating value and the opportunities it provides for jobs and careers. The main aim is to push tourism up the political agenda by working together across tourism sectors and boundaries. The Wales Tourism Alliance would therefore like to see as much engagement between the tourism industry and our politicians during the Week – 11th to the 19th May 2019 – although events either side are welcome too. Whatever your political views, we are at an historical juncture, it is important that we work together to showcase what we offer and how important the industry is to the economy of local communities in the light of the challenges to be faced from the UK leaving the EU. This week long ‘celebration’ aims to push the fact that our industry is one of Wales’s most resilient employers, job creators and a basic source of economic growth which must not be taken for granted. If you have an event that you would like to publish, then please register with the link below. Your event can be as simple as inviting your local AM or MP out to your business or local area for a meet and greet, with a cup of tea…but please let us know, cameras and press releases in hand! Please let us know if you’re planning to organise an event around the week by e-mailing marketing@nwt.co.uk. If you wish to discuss your distribution requirements please do not hesitate to contact the team on 01492 573887. North Wales Tourism has a wide range of digital marketing opportunities including banner and block advertising and also Video map on the GoNorthWales website with the opportunity to promote your product to an active, engaged and loyal online audience. 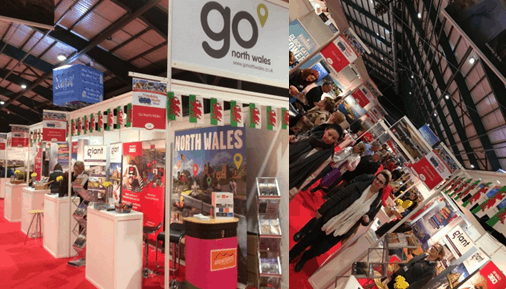 GoNorthWales has built a loyal base of followers and now through effective social media and email marketing, our audience has confidence in our brand. Digital advertising on GoNorthWales will mean your business will be seen by a wide range of potential visitors to North Wales. This is a fantastic way to showcase your business and to standout to the visitors. The National Minimum Wage is the minimum pay per hour almost all workers are entitled to by law. Use the National Minimum Wage calculator to check if you’re paying a worker the National Minimum Wage or if you owe them payments from past years. A new online course has been launched as part of the National Centre for Learning Welsh’s ‘Work Welsh’ project allowing those in the tourism and leisure industry to make greater use of Welsh while at work. The 10 hour ‘Welcome: Tourism’ course is available to all, free of charge and introduces vocabulary, greetings and everyday phrases. Comprising of 10 units there is an emphasis on pronunciation – giving learners an opportunity to practise pronouncing Welsh place names -and it also covers food and drink vocabulary and answering and transferring phone calls in Welsh. Find out more and access the course. Following a full and open public appointment process the Minister for Culture Sport and Tourism, Lord Elis-Thomas has selected Ian Edwards for the role of Wales’ representative on the Board of VisitBritain. Ian Edwards is CEO of both the Celtic Manor Resort in Newport, south east Wales, which hosted the 2010 Ryder Cup and staged the 2014 NATO Summit; and the new International Conference Centre for Wales which is to open early this year and based within the resort site. Ian was named Hotelier of the Year at the 2015 European Hospitality Awards; and was a member of the Welsh Government’s former Ministerial Tourism Advisory Board. As well as representing Wales at VisitBritain Board meetings Ian will also attend the Welsh Government’s Tourism and Marketing Department’s internal Tourism Management Board meetings. Here is some information about the Next Tourism Generation Survey Project assessing digital and sustainability skills in Tourism and Hospitality in Wales. The Next Tourism Generation Project (NTG) based at Cardiff Metropolitan University is assessing digital and sustainability skills in tourism and hospitality in Wales. Sectors include accommodation, F&B, tour operators and agencies, visitor attractions and destination management. Your views are important and NTG kindly requests that you complete a questionnaire (survey link below). The survey is available in English and Welsh. Participants can select their local area to ensure the results can be analysed at the destination level. The results will be shared with trade associations, local authorities, regional skills partnerships, training and educational organisations to inform future course provision. The survey complies with GDPR regulations and has been ethically approved by the university. The survey link will be live from Monday 14th January to Monday 4th February 2019. Completion of the survey should take about 15 minutes. For further information please contact the NTG team on 02920 416475. Thank you very much for your contribution.